What an amazing day for City of Preston Aquatics yesterday as they took part in the first ever Swim England national synchronised swimming Combination Cup in Manchester. The event attracted approximately 600 swimmers from clubs the length and breadth of the UK and CoPA entered two teams – in the 12 & under and 13 – 18 age groups. Against this stiff competition, both CoPA teams finished second in their events to gain silver medals! We are immensely proud of our swimmers – congratulations girls! It was a good day for City of Preston Aquatics in the Lancashire County Synchronised Swimming Championships on Sunday with medals being won across several categories and age groups. The day commenced with a novice figures competition and saw CoPA produce a hat-trick of podium results: Nema (gold), Rachel (silver) and Daisy Royle (bronze). In the solo events, Daisy Rushton claimed a gold for CoPA in the 13-15 age group whilst Elizabeth followed up with a silver in the 12 & under age group. 2nd and third places also went to Tilly (silver) and Rhea (bronze) for their routines in the 15 & over category. Imogen and Nema took a silver in the 12 & under duets, whilst Evie and Isabel G. did the same in the 13-15 duets. Another hat-trick of results for CoPA came in the 15 & over duet (although CoPA were the only club entering teams in this event!). The final standings were: Tilly & Rhea (gold), Izzy & Leah (silver) and Olivia H. & Ana (bronze). Finally, in the combination team events, CoPA took the top spot with their ‘Fairground Freaks‘ team (Daisy Rushton, Tilly, Leah, Rhea, Izzy, and Olivia M.), (gold), with the ‘Little Monsters‘ (Elizabeth, Nema, Rachel, Abby, Lola, Jorja, Chloe, Daisy Royle, Sofia and Immy) also finishing a credible 4th. Congratulations to all swimmers who took part, and thanks also to our friends from City of Salford, Kendal and Blackburn Synchronised Swimming Clubs for taking part and making the event a success. Full results can be found here. The Lancashire Championships event page has been updated with further details and times for the event. It was a hugely successful day for CoPA yesterday at the Warwickshire Synchronised Swimming Championships in Walsall. In the 12 & under figures, Natasha placed 3rd to gain a bronze medal and qualifying to swim solo, whilst Daisy finished 1st in the 13 – 15 figures, taking a gold and qualifying to swim solo. Meanwhile, Rhea finished 2nd in the 15 – 18 figures, taking a silver and qualifying to swim solo. The solo events yielded more medals with Daisy finishing 1st to take gold in the 13 – 15 age group, whilst Rhea finished 3rd in the 15 – 18 group to take a bronze. Natasha narrowly missed the podium, finishing 4th in the 12 & under age group with the first swim of a brand new routine. In the team combination events, the 13 – 18 team (Ana, Isabel, Olivia H., Olivia M., Evie, Izzy, Leah, Rhea and Daisy) took gold for an outstanding first place performance whilst the 12 & under team (Elizabeth, Nema, Sofia, Rachel, Imogen, Natasha, Lola, Jorja and Chloe) followed up with an impressive performance to take a 3rd place bronze medal. Full details of the timetable and start order for the Warwickshire competition are now available on the event page. The draw for the forthcoming City of Manchester Festival of Water Polo is now available. Please see the events page for full details. CoPA success continues in Croatia with GB Age Groups Free Team GOLD! 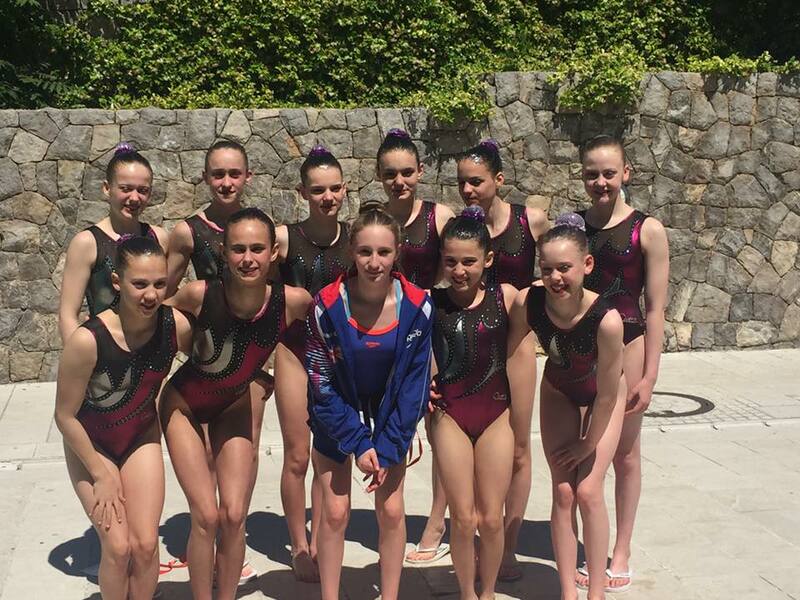 Hot on the heels of her impressive figures result, CoPA swimmer Daisy cemented her success abroad with a first place GOLD finish in the free team competition as part of the England Age Groups team at the international Primorje Synchro Cup in Rijeka, Croatia. Amazing result; we are very proud of Daisy and all of the England girls! CoPA is very proud of Daisy who has finished 5th in her figures at the international Primorje Cup in Croatia. Very well done Daisy! Good luck to Daisy Rushton competing with the England Age Group squad in Croatia this week!